The Choir Girl: "the Artist"
As promised, I will keep you up-to-date on my choral duties since I have been accepted as a substitute member for Pro Coro! It's my first brush with a professional group, and in this case, I mean professional in the sense that I will be paid. This is a new experience for me! The first surprise came in the mail a few days ago: my contract! I eagerly opened it and the first thing I saw was my name and "the Artist" in brackets after it. Wow, I've never thought of myself as an "Artist" before! I know it's probably just another generic arts term but it was a term I have never seen attached to my name. It was scary but cool to see that term printed next to my name! After that initial shock wore off, it was just strange having a contract. It outlined various things I would normally do anyway if I was in a choir---showing up for performances, not being late for rehearsal, learning the music etc. but it just made it so much more real to see all those terms written down. The main thing that made my heart panic was the fact that I would need to provide my own uniform. A long sleeved floor length black velvet gown. Where the heck would I obtain something like that!?!?! I wasn't about to go out spend $100s of dollars for an American choir uniform company to ship me some generic dress that I would have to hem myself anyway! Who knows how many concerts I will be singing at! Maybe this would be my first and last concert with them. It just doesn't make sense to make that kind of investment now. 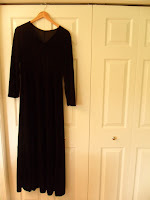 Where would I find a black velvet gown? I have to say, velvet is something not readily stocked in mainstream stores. Maybe I could try a thrift store? an mature lady's store at the mall? I was low on ideas. No matter what, I would need to start hunting. I googled to the far recesses of the internet abyss and came up with a few options but I was resistant to order them even after measuring myself numerous times with a tape measure and looking at individual sizing guides. I cursed the fact that my measurements didn't clearly fall into a specific category. I had a waist measurements for one size but the hip measurements for a completely different size. Oh, the woes of acquiring a uniform! I've gotten use to the luxury of having uniforms provided for me where all I would need to do is pay a rental fee. I called my mother explaining my predicament in an exasperated tone. In order to placate me she said that it wouldn't be that hard to make and that we could just buy some cheap Halloween costume type velvet and she could sew one. Essentially, it would end up looking like a tube with sleeves. Yay! I would not be on the stage naked! Thanks Mom! However, as a back-up, I also defaulted to an extremely handy tool: Twitter. I posted a message inquiring whether anybody had any ideas of where I could find a velvet gown. After a teasing reply from my sister asking me if the dress was in an effort to realize my dream of becoming a nun, I was delighted to get a response back from my friend Christina. She asked me if I would be interested in a velvet tent. I was slightly confused by the message and started to imagine a velvet dress with scoopy draping. When I did see her in person where she explained the fit of the dress and how it was made for her (for another choir she was in)... I began to have hope. It sounded like a dress that was specifically designed to be a uniform! We are roughly the same height, I'm a tad bit shorter and she says the dress is very forgiving fit-wise. She confessed that since the fabric is so stretchy she even wore a snowsuit under it one year when she had to carol outside in it. She promised to bring it for me the next day. She wanted me to try it right away so I put it on while at a Starbucks to see the fit. Also, I didn't go into the bathroom. I just put it on over my leather jacket and jeans. Christina and another friend dissolved into hysterical laughter---watching me wiggle my way into the dress while out in public. It actually fit pretty well! I required some help taking it off since it was sticking to my jacket so I had to raise my hands and get Christina to peel it off of me. Good times! Upon arriving home, my mom was relieved to see that I had found another option. She looked at the dress and said the velvet is a lot nicer than the cheaper costume velvet we had in mind. I was glad to have another thing off my mind since the last thing I need to do is run around searching for a velvet gown. The next thing will be learning the music for the Pro Coro! I just picked it up today so I will update you on my progress while I learn it! Congratulations! I look forward to reading about your experiences. Thanks! I'll definitely keep you posted! Also, did you end up auditioning for that choir you mentioned in a previous comment post? Well, I was going to chicken out and wait until next year, but after I read your post tonight I was inspired and I finally sent in the inquiry form. And thanks for remembering me and my previous comments! I'm glad you submitted an inquiry! Sometimes all we need it a bit of nudge to convince us to go ahead. I definitely needed one as well! I'm a strong believer that nothing bad can come out of an audition. You've really got nothing to lose. Maybe some lost time and a slightly bruised ego, if things take a turn for the worse, but it's totally worth it if you just take the risk to come out of your musical comfort zone. Even if you somehow don't manage to get in, it's the same as if you didn't try out at all. Plus, you'll always learn something from the experience, even if it's just knowing what to expect from a more formal audition. Keep me posted on your progress and best of luck! Woah, Sable! You even have a "guest blogger"?! John Williams + ESO= Love.